The entrance to the museum is in Niederkirchnerstrasse, formerly Prinz-Albrecht-Strasse, where at No 8 was the School of Industrial Arts and Crafts. After the seizure of power by the Nazis in 1933, the newly formed Gestapo (Secret Police) took over the building for its headquarters, and a year later Heinrich Himmler’s SS took over the Prinz-Albrecht-Palais around the corner in Wilhelmstrasse. By 1939, with the help of Reinhard Heydrich, Himmler transformed this former palace of the Hohenzollern family into the main office of the Reich Security (RSHA). Being both head of the Gestapo and the SS, Himmler’s enthusiasm for his job is well known. If he wasn’t torturing people here, he was planning where he could do it elsewhere, but on 23rd Nov 1944 all his plans started to fall apart when the RAF bombed his headquarters. With the end of the war in sight Himmler was eventually captured and taken to Luneburg where he committed suicide. The Russians captured Berlin but under the London Protocol of 1944 the site ended up in the American Sector – but only just, because the boundary ran along Prinz-Albrecht-Strasse. The longest stretch of the outer wall still left standing in Berlin still runs along here and has become part of the museum’s outdoor museum space. By the early 1960s what had been left of the buildings was cleared and left as a wasteland until 1987 when Berlin celebrated its 750th anniversary and re-discovered the site. During excavation work the cellars of the Gestapo headquarters were unearthed and an outdoor museum was created with a roof covering what remained, and illustrated with pictures of events and people of the times. After lots of deliberation with what to do with this waste land the idea of a permanent museum was suggested, but it took until May 7th 2010 before the suggestion became a reality. 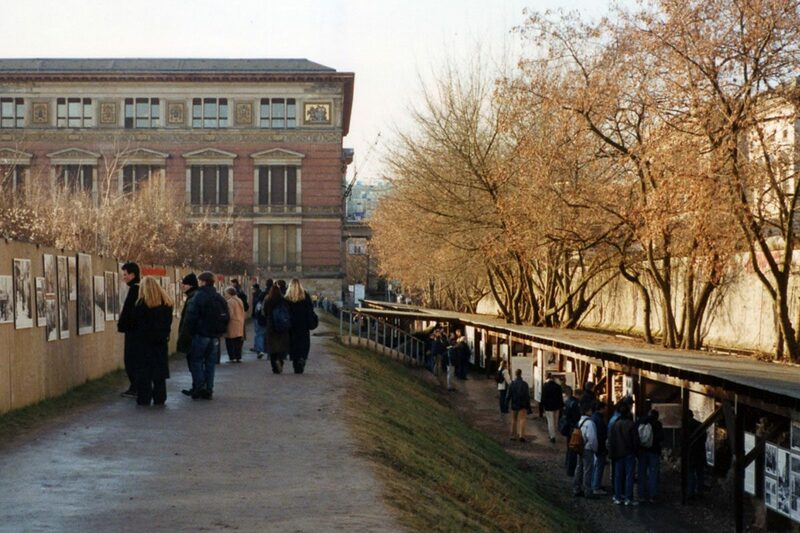 There are three sections to the museum – the outdoor section as mentioned above which runs under the Berlin Wall, the grounds of the entire site with 15 information stations explaining the various points of interest, and an indoor exhibition. The modern steel and glass construction of the indoor exhibition is in complete contrast to the classical buildings that once stood here. It’s known as the Documentation Centre which explains its function, and the layout inside is light and airy, which I suppose lightens the tone a bit for such a dark subject. Most of the space is used up by boards showing copies of photographs and documents covering the major themes connected with the site and beyond. This is where I took the old black and white pictures of how the site used to be. The pictures taken in 2003 were from my first visit. Entry to the whole museum is free, very central and should be a ‘must see’ on everyone’s visit to Berlin. If the people of Berlin think that this place should be remembered, then I think we all should too. Couldn’t agree more. Anything that acts as a reminder of the horrors wrought by the gestapo and the SS has to come to the fore. This is a part of Berlin I have never visited, though I certainly intend to. Unfortunately both of my sons have moved away from Berlin by now, so I don’t go there as often as I used to.